Last February, I – piggybacking off a great short essay by Ed Felter on what he called “Property Rights Management” – said that I wouldn’t be surprised to see things like DRM making their way into other devices that don’t explicitly have to do with the kinds of software and firmware in which we’re accustomed to seeing DRM. Literally one year later: Keurig! The moral of the story is always listen to me. No, seriously, the moral of the story – if there is one – is that this stuff always makes its way into other things. Companies need to have control over their devices so that they can maximize their profit however possible, but also just because – I think – they just sort of ambiently feel the need to maintain that control. For a corporation, a lease is always going to be more attractive than a sale. If they can turn owners into users, they will. On the face of it, this all seems rather ridiculous, and mostly just annoying. But again, what it really amounts to is precedent: We have DRM in our digital devices, we have DRM in our software and our firmware, and now we have DRM in our coffeemakers. Or one coffeemaker. Don’t mistake this as anything other than a test run for the future. The hopeful thing here for me is – as happened with the XBox One and SimCity – customers are noticing it and they’re talking about it, a lot, and the talk is not favorable. People don’t want this. No one, as far as I can tell, is finding Keurig’s claims about the benefits convincing (because come on, they straight-up aren’t). Companies who implement DRM have adopted the tactic of insisting that it’s not actually DRM – recall EA’s insistence that SimCity’s DRM was actually about taking the burden of computations off players’ machines and placing them server-side, which was pretty much categorically disproved – but again, no one really buys that. Consumers, by and large, sense what’s happening. They know they’re being turned into users. And they don’t like it. We want to own what we pay for, and that means that we want to be able to use it how we want. There are devices that we just sort of grumblingly accept will be sold to us pre-broken – cell phones, for instance – but when DRM shows up in something we’ve taken for granted as DRM-free, the results from the supply side aren’t good. When DRM is intrusive, that’s a net positive. Also, as Cory Doctorow points out, the possibility of actual lawsuits over this might be a benefit as well, if it solidifies some aspects of this into legal precedent. Copyright law is fuzzy on this, and depending on the outcome, it might be a very good thing if it became less fuzzy. 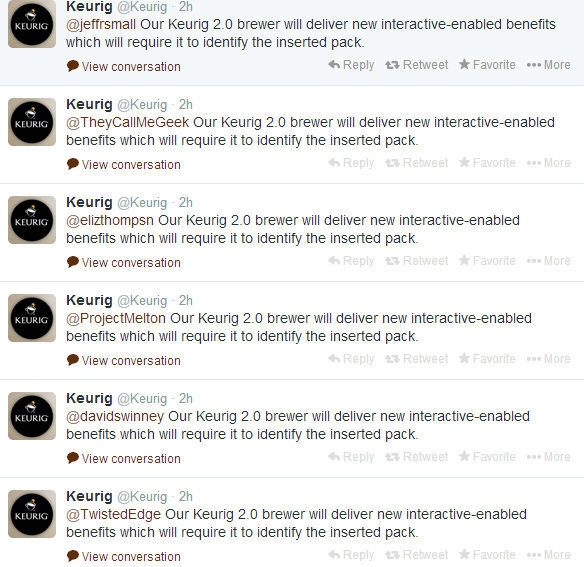 So yes, I regard this as a misstep on Keurig’s part. As a trial run, I’m not optimistic that it will work out well for them. But I think that this stands as yet more evidence that DRM-creep is something to watch for. It’ll show up again, and next time it might be much less noticeable. And that will truly be something to worry about. I'm wondering,(as I did more generally there), is this interactivity confined to you and the coffee maker, or does it transmit info back to Keurig? The disingenuous thing about their "explanation" is that they could instead choose to release the Keurig 2.0 "interactive" protocol as an open format, allowing third parties to tell the machine the optimal settings for their particular brew. This would actually produce a benefit to the consumer, as opposed to just more lockin for Keurig.